After gaining strength overnight, Hurricane Michael will be a storm of unprecedented intensity for the Florida Panhandle when it is expected to make landfall later today (Oct. 10). 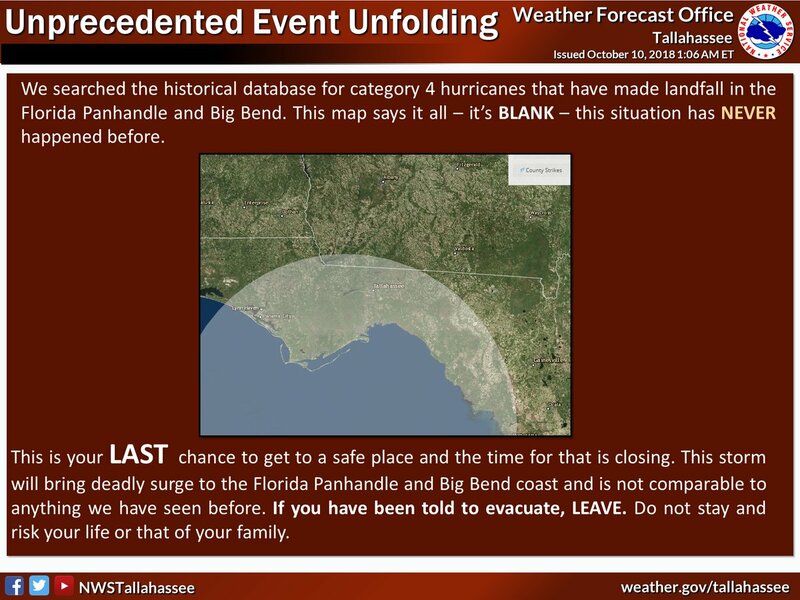 “This storm will bring deadly surge to the Florida Panhandle and Big Bend coast and is not comparable to anything we have seen before,” the National Weather Service forecast office in Tallahassee said in a warning just after 1 a.m. ET. Florida Gov. Rick Scott declared a state of emergency for 35 Florida counties ahead of the “monstrous” storm, and more than 100,000 people have been ordered to evacuate, according to the Tampa Bay Times. As of 5 a.m. ET, Michael was about 130 miles (215 kilometers) southwest of Apalachicola, Florida, and moving at about 13 mph (20 km/h), according to an advisory from the National Hurricane Center. Unlike slow-moving Hurricane Florence, which made landfall in North Carolina last month and dumped record-breaking amounts of rain, Hurricane Michael is moving quickly. “The storm is fast-moving, so only 6-10+ inches (15-25+ centimeters) of precipitation are forecasted to fall over the Panhandle,” Marangelly Fuentes, a NASA atmospheric scientist, told NASA’s Earth Observatory. However, Hurricane Michael’s strong winds and storm surge could be devastating. The worst storm surge is expected to occur between Tyndall Air Force Base near Panama City, Florida, and Keaton Beach, Florida, and it could be up to 13 feet if it occurs at the same time as high tide. 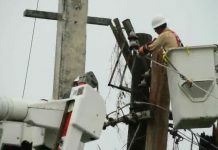 The strength of the hurricane is especially alarming because many people in the Panhandle “have little or no experience with storms this intense,” Fuentes said. “Only eight major hurricanes on record have passed within or near the projected landfall of Michael, and only three of those (Eloise 1975, Opal 1995 and Dennis 2005) occurred in the past 100 years. 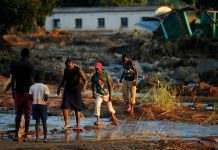 Michael already proved deadly in Central America, where at least 13 deaths associated with the heavy rains and flooding were reported across Honduras, El Salvador and Nicaragua, according to the Associated Press. After making landfall, Michael is expected to weaken as it swerves northeast over Georgia and South Carolina before reaching the Atlantic Ocean on Friday, according to the National Hurricane Center. Be ready and prepared for this unprecedented Hurricane! Payers for Florida! 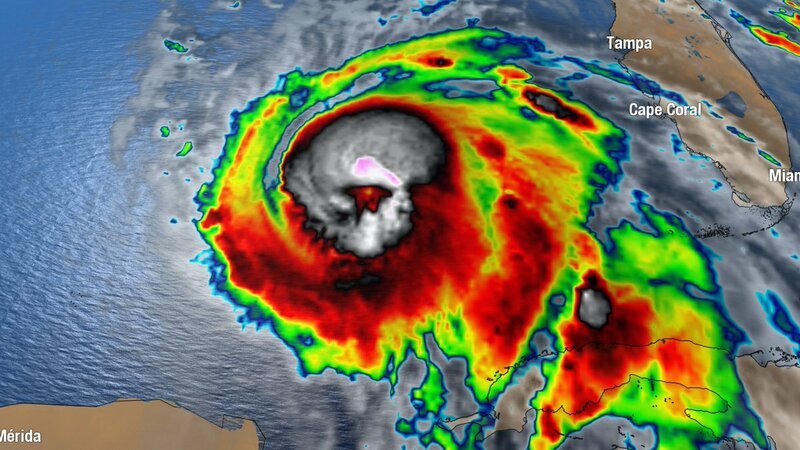 Hurricane Michale looks much stronger than Hurricane Florence. It has already flooded around Panama City, and started destroying many buildings. Yesterday, I was joking “I want Category 10!” It looks like it is going to be powerful as Category 10 hurricane. Unbelievable destruction of Hurricane Michael! It looks like exactly WAR ZONE! Mexico Beach, Florida just next to Tyndall Air Force Base was demolished completely. Mexico Beach used to be a nice resort for high rank (Reptilian) military officers of that Air Force Base. Many of properties are owned by rich military officers. You might not know who much those military offers get. They are getting salary more than $100,000. Some military officers can get more than $150,000 a year. Those savage people own most of the properties in Mexico Beach. You cannot imagine how much KARMA accumulated by those people around that area. Those accumulated karma invites all the disasters and destruction. Remember all the chemtrails (poisons) are sprayed over your head by US Air Force. US Air Force goal is depopulation in the US. Wingate Hotel roof was blown off and wall came off. Look at the building of First Federal Bank of Florida! This is really crazy. It looked like a big earthquake hit this building. Look at seismographs! Something is going on! The Earth is wobbling. I have been checking seismographs quite for long time. I have never seen like these. I’ve also checked Yellow Stone seismographs. They never changed! These seismographs are FAKE! They are hiding real activities in Yellow Stone. 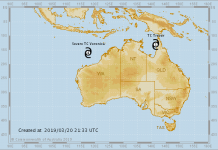 G20 Conference was happening in Indonesia, then M6.0 earthquake hit near Java Island where the conference was happening. The G20 (or Group of Twenty) is an international forum for the governments and central bank governors from Argentina, Australia, Brazil, Canada, China, the European Union, France, Germany, India, Indonesia, Italy, Japan, Mexico, Russia, Saudi Arabia, South Africa, South Korea, Turkey, the United Kingdom, and the United States. Right now, the Earth is quarantined by Galactic Federation of Light. Reptilian Entities including NASA and SpaceX are not allowed to go out of the Earth nor go into the Earth. All the spaceports (teleportation ports) have been closed including Spaceport America. USGS hides some earthquakes (USGS pretends those earthquakes have never happened). USGS down grade M7.0 earthquake to M6.0. What a crook USGS is!